The single most versatile instrument for astronomy, bird watching and other nature related activities is a pair of binoculars. Helios Powermaster 12-36x70 Zoom Porro Prism Binoculars is small and light but yet powerful so can easily be taken on trips. Helios Powermaster Binoculars provide a wider field of view of 3.0 to 1.4 degrees which reduces the problem of finding objects in the binoculars, which can be a real challenge for a beginner using a telescope with its much narrower field of view. 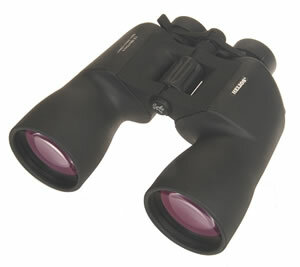 Binocular contains high Quality BaK-7prisms which provide excellent optical performance. Prism made with BK-7 has a little less spherical overcorrection and chromatic deviation at blue/violet. With large 70mm diameter objective lens of BAK-7 prism and completely multi-coated optics, the scope ensures amplified clear, bright images of high quality. Helios Powermaster 12-36x70 Zoom Porro Prism Binoculars is covered with the Rubber armour that protects the scope from scratches. Twist-up eyecups are provided making them suitable for spectacle wearer Tripod adaptor bush allows binoculars, to be fitted to any standard photographic tripod, when maximum viewing stability is required. Available in 60mm, 70mm and 80mm sizes, these large aperture rubber-armoured binoculars with their powerful continuous zoom magnifications will bring distant objects close into view. All models feature quality BK-7 prisms and fully multi-coated optics. Twist-up eyecups are provided making them suitable for spectacle wearers. A tripod adapter bush is incorporated so the binoculars can be easily mounted onto a photographic tripod with an L-type binocular tripod adapter. The single most versatile instrument for astronomy, bird watching and other nature related activities is a pair of binoculars. Helios Powermaster 13-40x80 Zoom Porro Prism Binoculars is small and light but yet powerful so can easily be taken on trips. Helios Powermaster Binoculars provide a wider field of view of 2.7 to 1.3 degrees which reduces the problem of finding objects in the binoculars, which can be a real challenge for a beginner using a telescope with its much narrower field of view. Binocular contains high Quality BaK-7prisms which provide excellent optical performance. Prism made with BK-7 has a little less spherical overcorrection and chromatic deviation at blue/violet. With large 80mm diameter objective lens of BAK-7 prism and completely multi-coated optics, the scope ensures amplified clear, bright images of high quality. Helios Powermaster 13-40x80 Zoom Porro Prism Binoculars is covered with the Rubber armour that protects the scope from scratches. Twist-up eyecups are provided making them suitable for spectacle wearer Tripod adaptor bush allows binoculars, to be fitted to any standard photographic tripod, when maximum viewing stability is required.